Want a beautiful multi function family room? Using these 6 tips will help you to add style to a space where you spend a large part of your time! If you’re like most people, you want to have a beautiful family room, but that can be tough in a room that probably needs to serve multiple functions. Families that I know want a space to watch television in, a place to play family games, a place to eat meals or snacks, possibly even a place to work. No matter how you use your room, you’re sure to want a spot to hang out and relax in and enjoy family time together. 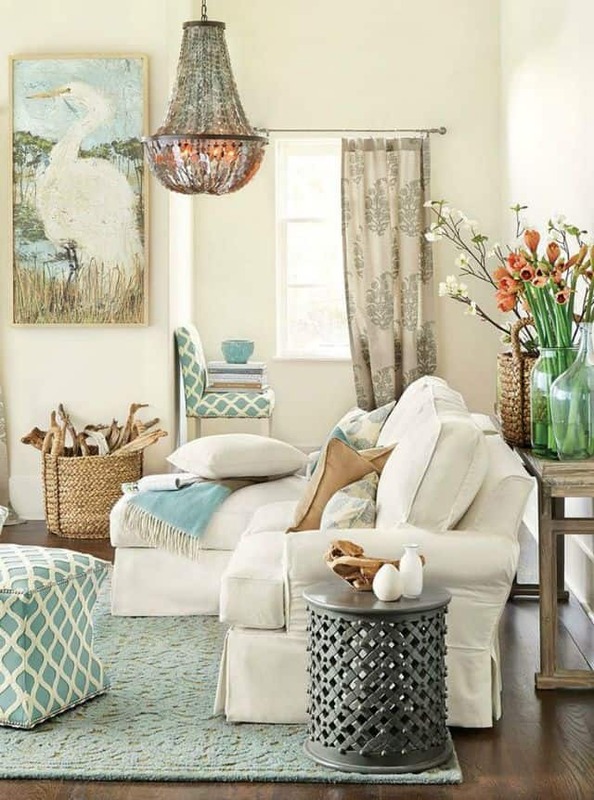 Trying to fit it all in can be tricky, but it can be done with careful planning and stylish choices. …develop a space plan. This step is probably the number one most important thing to do when designing a space – most especially if you’re purchasing new furnishings or if your room needs to perform multiple functions. You can do something as simple as a pencil sketch on a piece of paper with a to-scale drawing of your room with the furniture pieces drawn in. 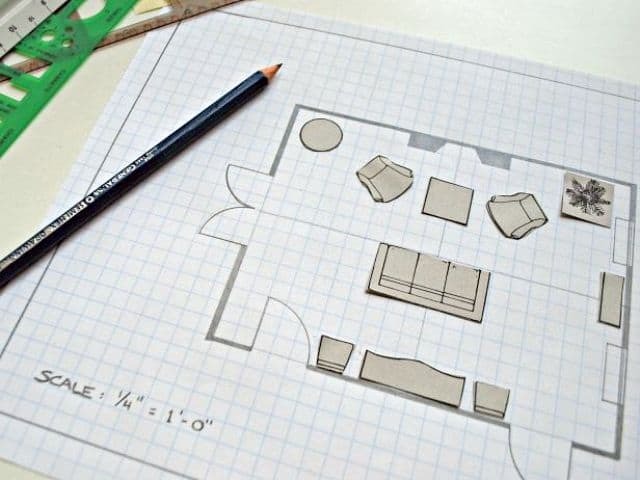 Or you can make a to-scale drawing of your room using small pieces of paper that are cut to the scale of whatever furniture you’ll use and move them around on the paper until you come up with a floor plan that you like. Graph paper comes in handy, as you can assume that one square on the paper is equal to one foot. Make sure to include window and door openings and traffic patterns in your drawing. This one step can help prevent costly furniture purchase mistakes. Ask me how I know. These room furniture arrangement diagrams may help to get you started. Who says you have to use small furnishings or that you can’t use a sectional sofa in a multi functional family room? I say pooey to that notion! I do, however, recommend keeping the lines clean and simple so that you don’t wind up with a cluttered look to the room. Consider placing matching chairs side-by-side. If space is an issue, there are many options available for tiny tables that could be placed between them. Notice the open coffee table that allows for storage underneath and the stools in front of the fireplace for extra seating. 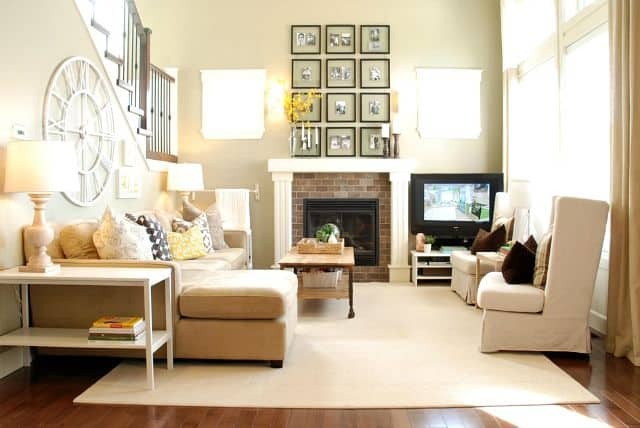 There are several ways to incorporate a place to work in a family room and still have a beautiful space. A table placed behind a floating sofa can act as both a desk and display space. Use a chair that can be used for extra seating when the table isn’t being used as a desk. A console table can serve as a bar or as a serving spot for meals. 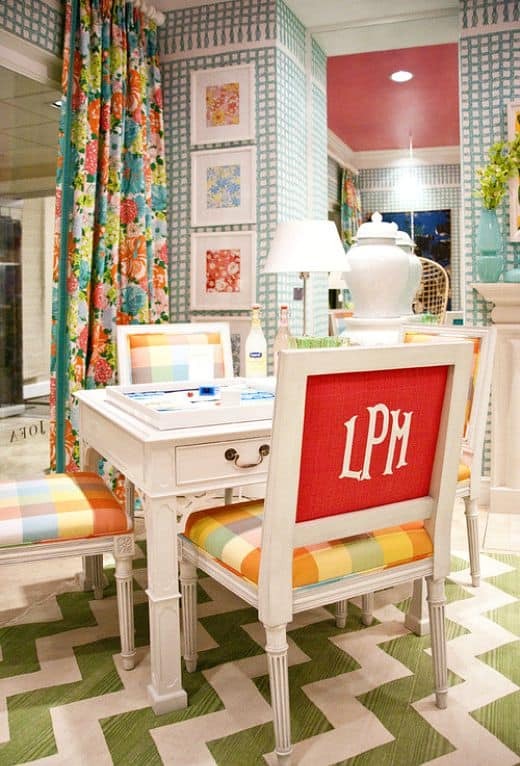 A small round table in a corner can serve as a side table or can be pulled out into the room to be used as a dining table, game table or as a place to work. Think about using one large statement art piece instead of a lot of smaller pieces. It will give more drama to your room and is another way to keep the cluttered look at bay. If you create a gallery wall, keep a uniform size to the overall dimensions. This chart should help. Using mirrors will reflect more light into the room. 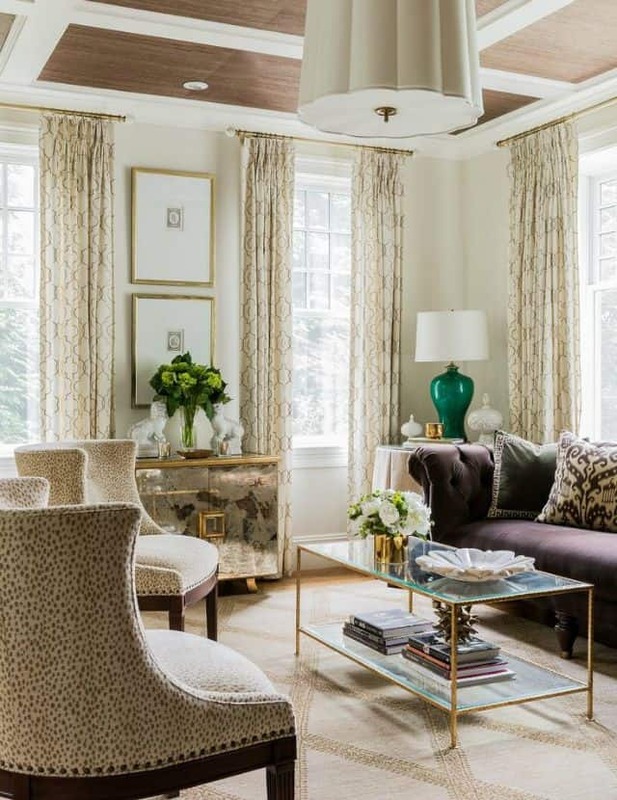 Window treatments are the jewelry for a beautiful room! Hang them above and outside of the window frame to give the illusion of more space and to make the windows appear larger. A glass top table will seem to disappear in the room and won’t seem to take up as much space. You might not like this choice though, as finger prints and other smudges will certainly show! 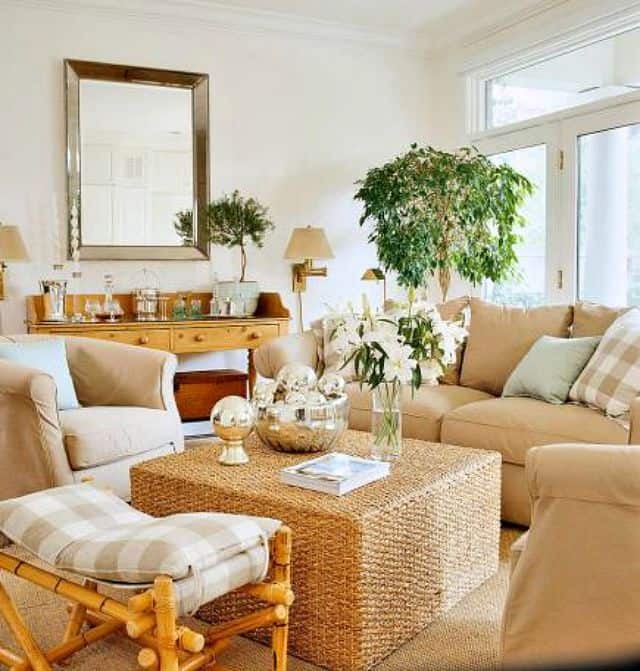 Consider using a round coffee table or one with rounded edges so that you aren’t constantly bumping your knees in a tight space. 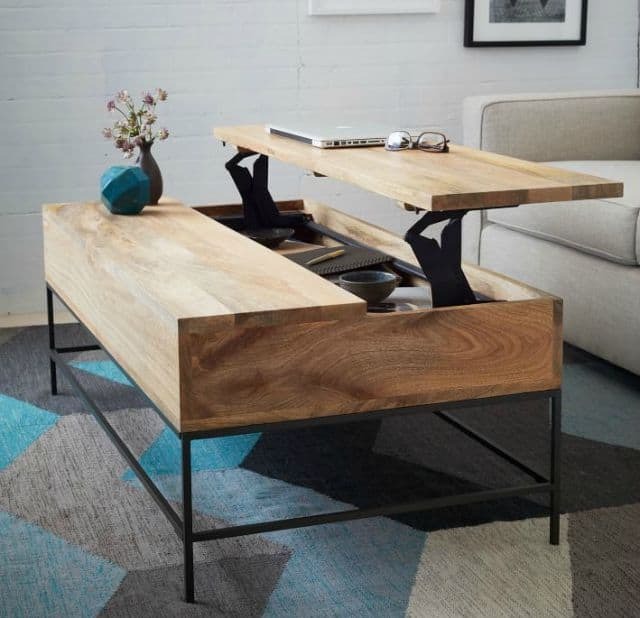 A pull-up coffee table can act as a work space, eating space or play space. 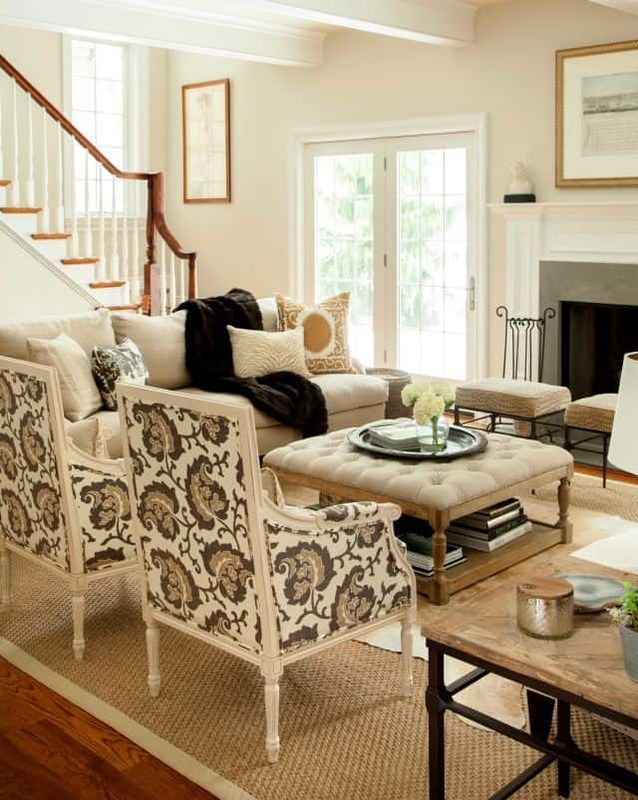 A round upholstered ottoman can serve as a coffee table, extra seating or just a place to put your feet up. 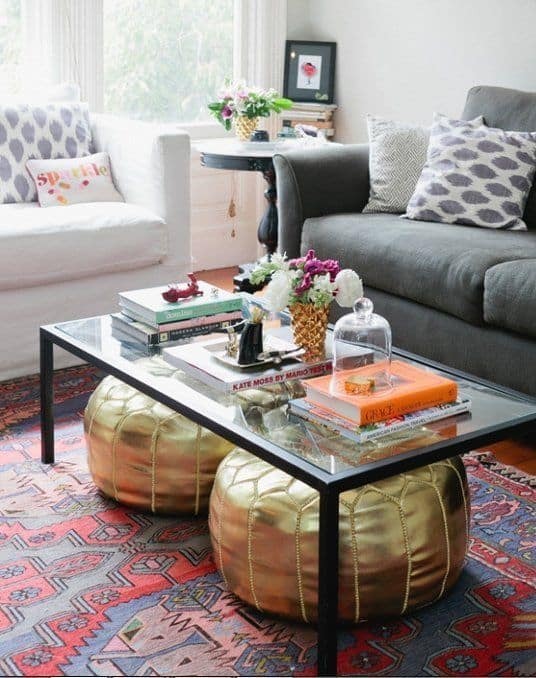 Use a coffee table that’s open underneath so that you can store small stools for extra seating. Even a small, narrow bench can serve as a coffee table. Sometimes a small space can present challenges for tv viewing. Consider mounting your tv on the wall with a swivel bracket. That solution works great for us in our beach condo and allows us to view the tv from multiple places in the room. You would be amazed at how much larger a space appears if you have a large mirror leaning against a wall. It only takes up a few inches of floor space. Just be careful with what you are reflecting in the mirror. 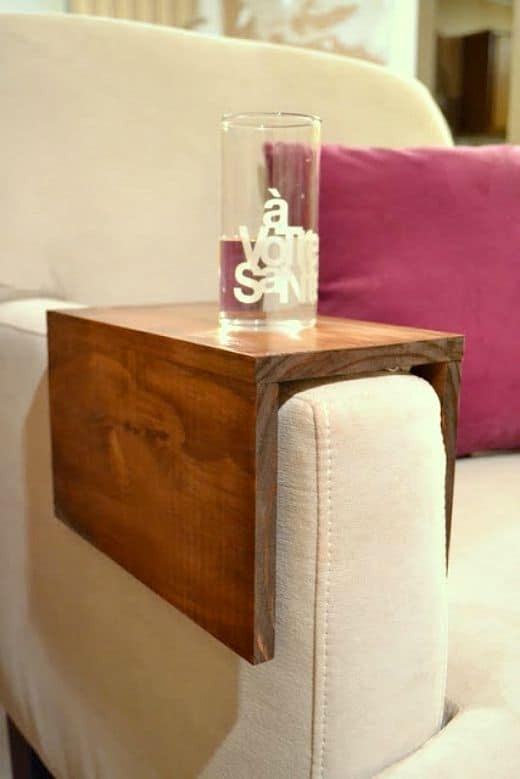 Simply no room at all for a side table? Make a couch sleeve. Visit the Ugly Duckling for the tutorial for this easy project. When it comes to color, it’s totally up to you! There are those who say that a space should only be painted and decorated with light colors, if you are working in small room. In my book, there are no decorating rules! Take your time and create a room that is uniquely you and you’ll always love it. Good advice! Our rooms are all small in this old house, but I’m told that people were smaller. Ha – you’re too funny, Kirby! I’ve heard the same thing though. That’s great, Alicia. I’m so glad that you found some inspiration! I LOVE that white clock in the second picture! Great tips! 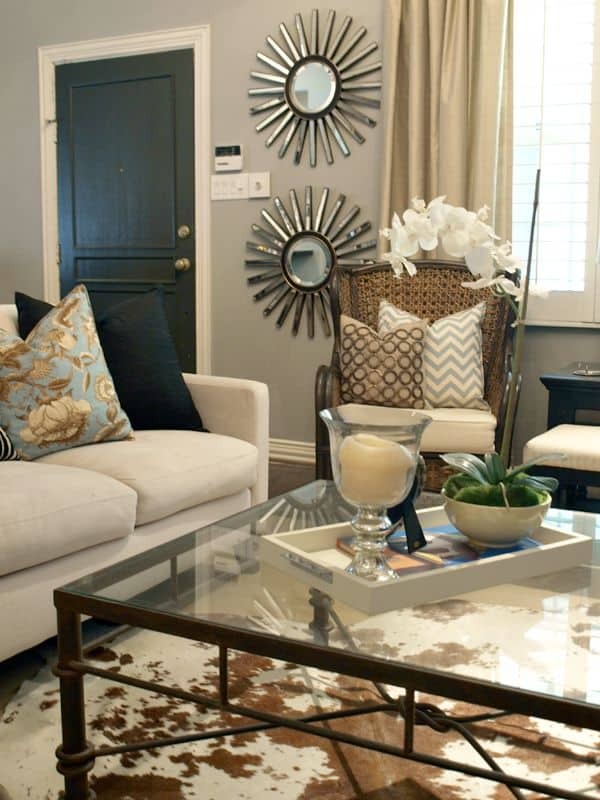 I am in love with the grey sectional in one of the above photos! The one with the green coffee table. We are in the market for a new sofa. 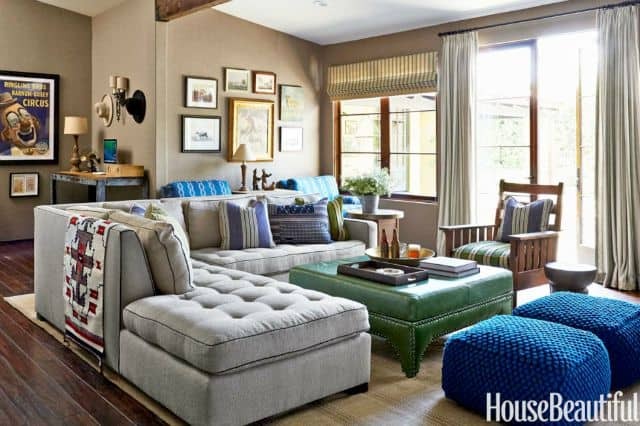 I tried clicking the link that says HB below the pict to see if I might find where the sofa is from, but it took me to HGTV website, not HB I think you may have accidentally put in the wrong link. I would very much appreciate if you could check that and if you have the link to that picture, I would love to try and find a price and source for that sofa! I want it! Thanks! Hi Nicki. You’re right – I did have the incorrect link, but I’ve corrected it now. The info tells a little about where the sofa came from. Thank you for letting me know and good luck on your sofa hunt! 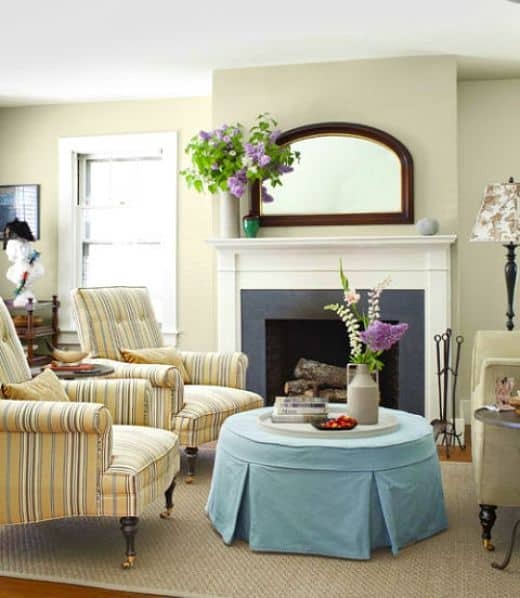 We have a very small family room, so these are some great tips. Thank you for linking up at #HomeMattersParty this week,and we hope to see you again next week too. I have a small den that I can not finish. I was gifted an amazing very expensive couch the only problem is the color. It is a very deep forrest green the other 2 chairs in the room are cream colored wingbacks . What colors do I use to tie the room together? 1 wall is covered with huge windows & another has a fireplace HELP!!!! Great post! Thanks for the feature! I have an open concept LR?Kitchen area with a corner fireplace. It’s odd shaped and very difficult to arrange. I’m going to incorporate some of these tips for it. Great post with so many great tips! Great tips and I really found the diagrams helpful. I always find inspiration on your site. Beautiful inspiration photos. 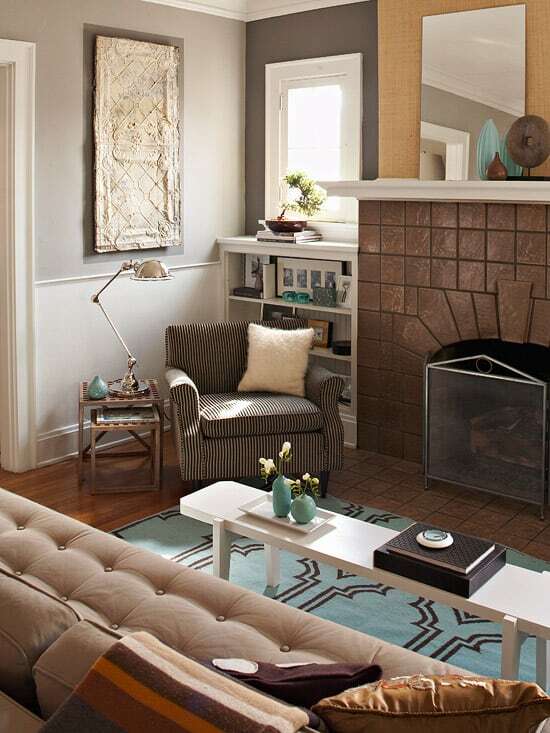 The photo with the prints above the fireplace (source unknown) is from Ashli’s former blog Malliardville Manor. She no longer has a blog, but is on Instagram. Don’t know how I missed this post, but it is jam packed with ideas! 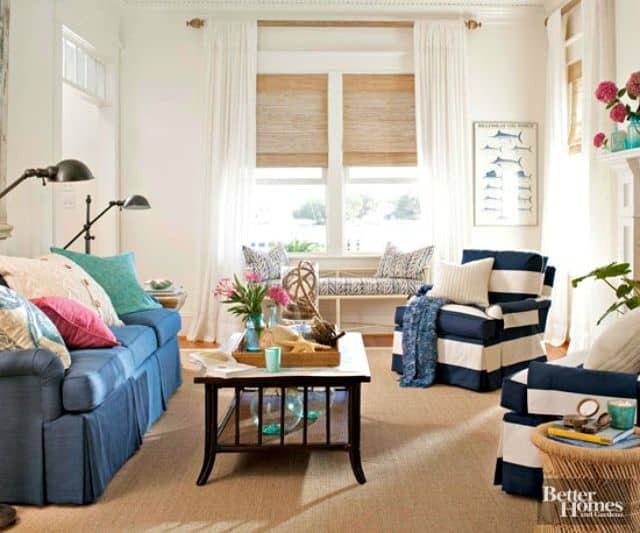 I especially liked the idea of the desk behind the floating sofa and the arm sleeves. We never have enough table space in our great room for people to set their munchies and glasses. These are a perfect solution. I love the reflection of the back to back sofas. I may try it with my love seats to see if it has the same effect. 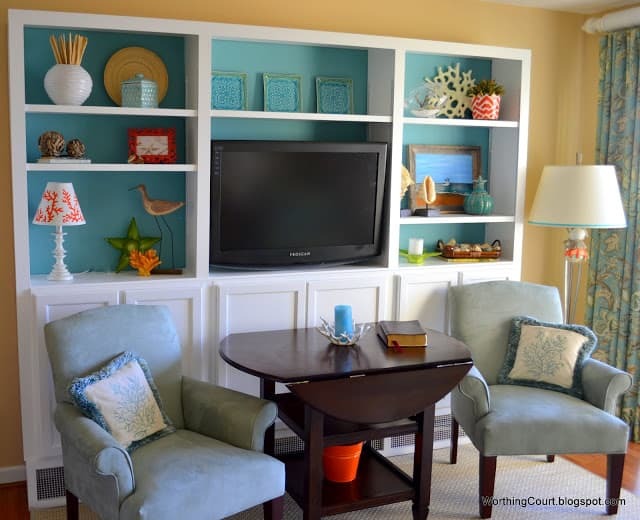 I want to do something different with my family room and these are great tips. Thank you! 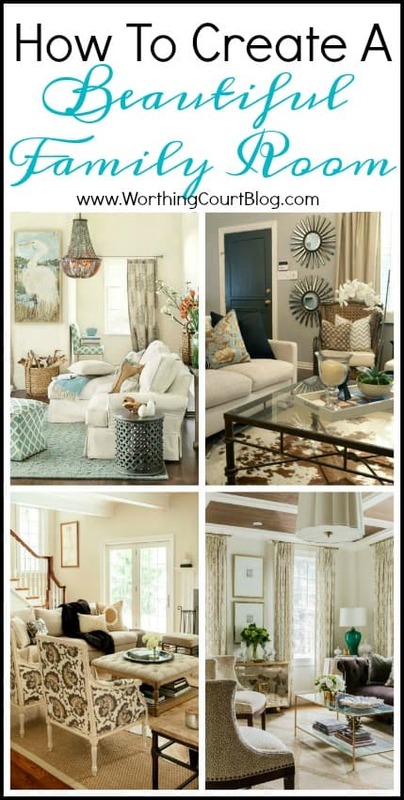 Some very useful advice , thanks for sharing all your decorating tips! Great timing for me! I am in the process of redoing my family room. Thanks for the great tips. I found just the advice I needed for picture hanging. I’ve been trying for over a week to figure it out. Now I know what I’m going to do. Thank you! Great tips. My space is cozy/small. I have had to purchase pieces that serve double duty. Great post. Beautiful and inspiring. I seem to do a lot of trial and error, with errors being rampant. lol I struggle with clutter. When a room isn’t coming together, my default reaction is to add more, more, more. Trying to overcome this in my old age. ? I just found your blog. Your home is beautiful! Is there a place on this blog where you share your paint colors? I love your gray and gray blue choices. Any chance you know the source of the pedestal table in the Haus Design photo? Thanks!